This gorgeous luxury Mothers day card is a wonderful choice for you to send your love to your Mum on Mother’s Day. 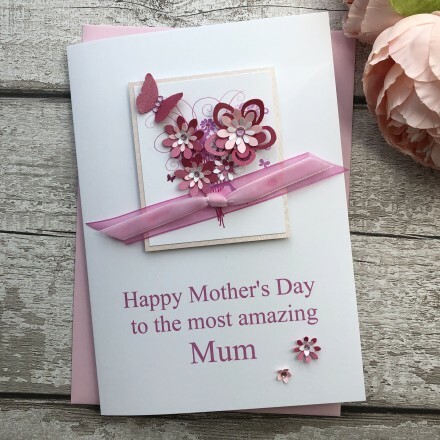 Stunning Mother’s Day Pink Roses Card which features a raised panel with the image of a flower bouquet, decorated with ebony butterflies, jeweled flowers, finally layered with satin ribbons, this combination makes a stunning design. A truly stunning luxury personalised mothers day card is a gift in itself.